It's somewhat starting to feel like fall here in Florida. It's interesting because it usually isn't until November when it starts to get cooler. By the way, what I mean by feeling like fall is it's been under 90 degrees and there isn't as much humidity :P. It still is in the 80's during the day, but it feels great a night. I know that's probably someone's summer weather, but for Florida it is a nice change! Today I have a great fall color from Wet n' Wild for you. Haze of Love isn't really red, a purple, or a brown. I think it's a nice mix of all three colors. It has a dusty quality to it where it is more muted. This is a great creme shade. I got this for $1.99. This color reminds me a bit of Zoya Stacy, just a lot cheaper! That's a very pretty color for fall! By the way, that's so funny, here (in Finland) it has been something like 10 degrees celsius (=50 degrees fahrenheit) and it's considered quite warm for this season. Next week it's going to be only 2 degrees celsius (35.6 fahrenheit) or so.. So those temperatures that you told about would definately be our summer weather..
i bought this color a while ago and haven't worn it yet. never realized how pretty the color is until now. will do my manicure this week with it. Love the color of that, and such a deal. 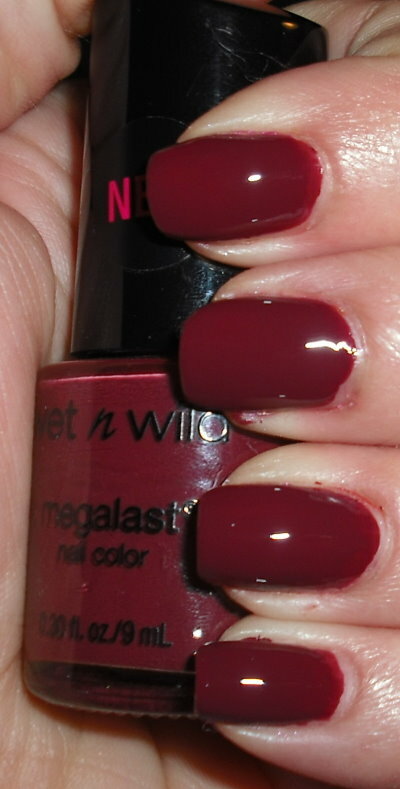 One of my fave polishes is from Wet n Wild. cute fall color! we had great weather today, 86 degrees. i'm enjoying the break from the cold Fall weather. Very nice, especially for fall! I loves me a medium berry creme!! Great color. And you can't beat the price.